This nautical wall hanging "Racing the Wind" shows sailing boats on the seas, from contemporary artist Michael O'Toole. The works of O'Toole have a signature of a harmonious use of color, and celebrates the nautical life on the sea and in port cities. In this work, we see the dramatic movements of a sailing boat racing with a sense of movement created by the semi impressionistic rendition of the skin and sea. The blues of the ocean is complemented by the beiges which reflects the colors that are present in this time of day. This is further echoed by the blues, beiges and red browns in the rest of the scene to give a harmonious balance to the piece while retaining its impressionistic feel, a hallmark of the work of O'Toole. 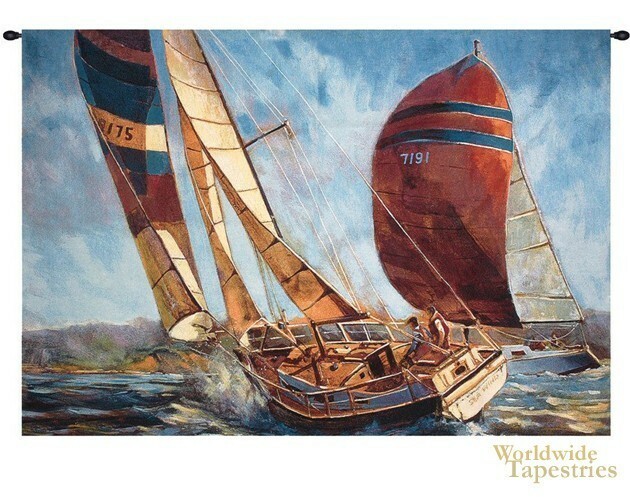 This nautical tapestry "Racing the Wind" is backed with a lining and has a tunnel for easy hanging. Note: tapestry rod and tassels, where pictured, are purchased separately.